OptiVision Eye CareServicesWhat is a Cataract? 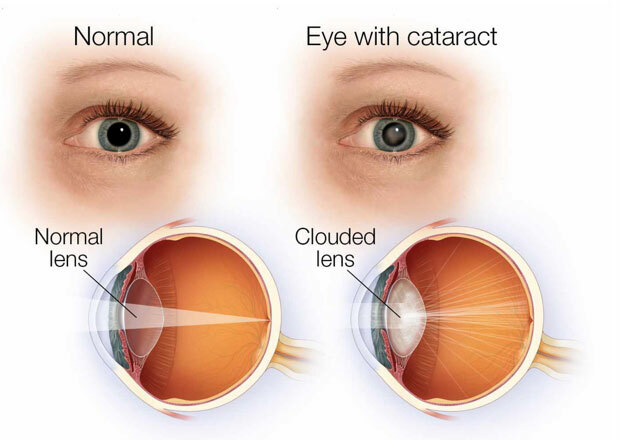 A cataract is a loss of transparency, or clouding, of the normally clear lens of the eye. As one ages, chemical changes occur in the lens that make it less transparent. The loss of transparency may be so mild vision is hardly affected or so severe that no shapes or movements are seen, only light and dark. When the lens gets cloudy enough to obstruct vision and affect your lifestyle to any significant degree, it is called a cataract. Glasses or contact lenses cannot sharpen your vision if a significant cataract is present. The most common cause of cataract is aging, although a cataract can occur at any age. Other causes include injury, medications such as steroids, systemic diseases such as diabetes and prolonged exposure to ultraviolet light. Your eye works a lot like a camera. Light rays focus through your lens on the retina, a layer of light sensitive cells at the back of the eye. Similar to film, the retina allows the image to be “seen” by the brain. But over time the lens can become cloudy and prevent light rays from passing clearly through the lens. This cloudy lens is called a cataract. The typical symptom of cataract formation is a slow, progressive, and painless decrease in vision. Other changes include: blurring of vision; glare, particularly at night; frequent eyeglass prescription change; a decrease in color intensity; a yellowing of images; and in some cases, double vision.